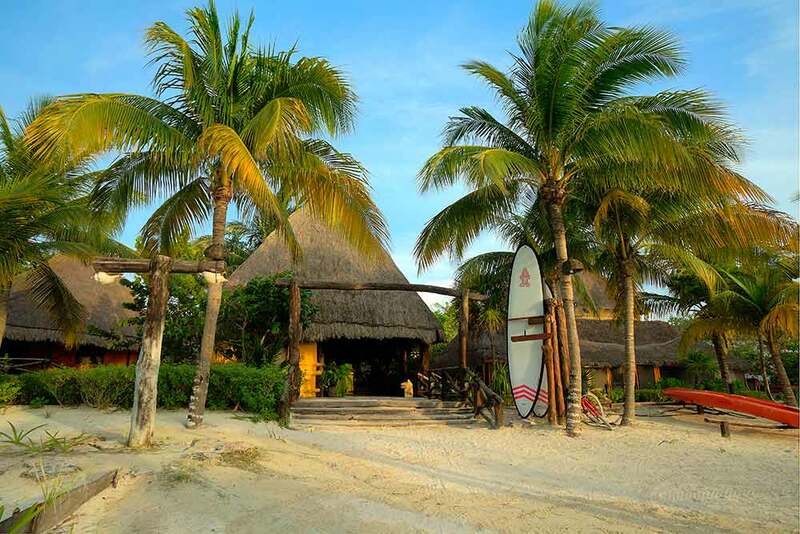 In keeping with the small-island feel, there are no high-rise hotels on Holbox. While there are some hotels in the town, most people come to Holbox to be directly on the sand so many of the hotels are on the main stretch of beach. 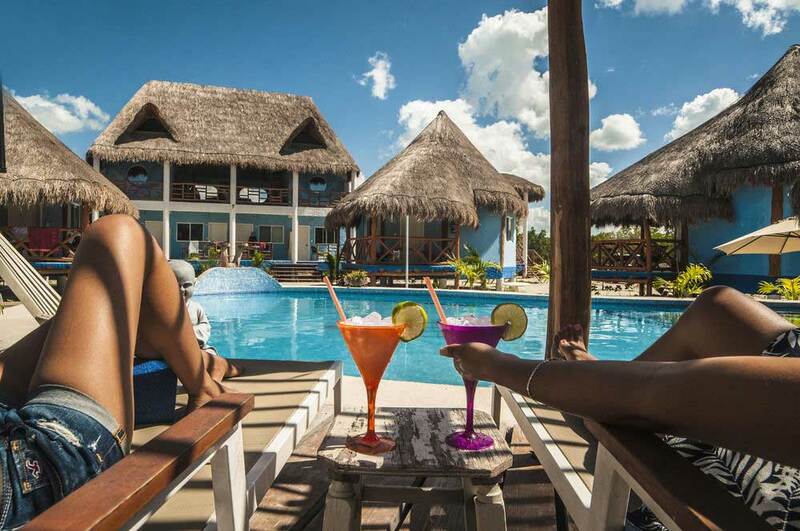 It isn’t always easy to find cheap hotels on Holbox, but we make finding the best deals easy. There is also a good selection of luxury and boutique hotels, perfect for honeymoons or extravagant getaways. Holbox is quickly becoming a travel mecca for those desiring remote, unique, and beautiful Mexican beaches. If you don’t mind staying in the town, which is actually only steps from the beach, then another great budget option is Hotel los Arcos. This quaint little pink hotel is simple but central and very well priced for those who don’t want to camp or share a dorm. It is the perfect place if you intend to spend most of their time at the beach and just need a place to sleep. As they say in Mexico bueno, bonito y barato. 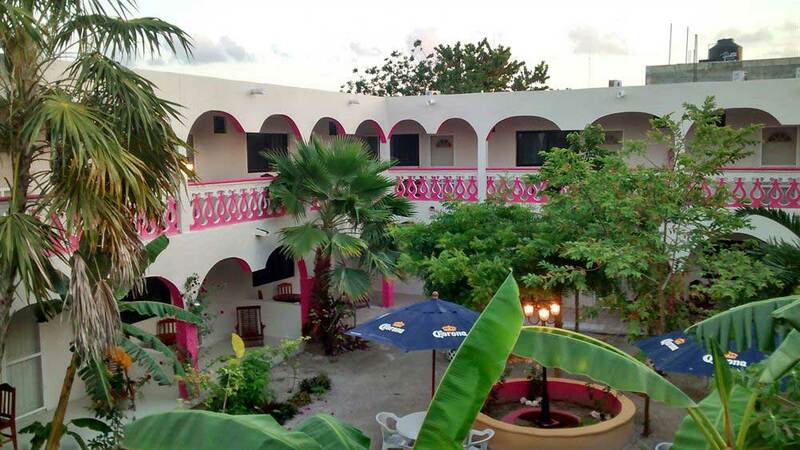 This colorful, laid-back hotel is located directly on the beach and boasts a youthful, vibrant atmosphere. Care has been taken to make the rooms nice and use of the communal kitchen allows you can cook up your own meals with the fresh catch of the day. The hostel runs a program of workshops and yoga as well as organizing kite surfing adventures, all of which make it a great place to come if traveling alone. This is a really upbeat place with music and parties, so don’t stay here is you want peace and quiet. At Hostal Ida y Vuelta you can chose from sleeping in a hammock, camping, sharing a dorms or enjoying a private room or bungalow. It is a great option for those who want to spend as little money as possible but still want a nice bathroom to use and a friendly atmosphere. Camping spots are in shaded areas, which helps with the heat and the hammocks come with mosquito nets so that you can sleep tight without the bugs biting. This sweet property located about three minutes from the beach is a great midrange option. 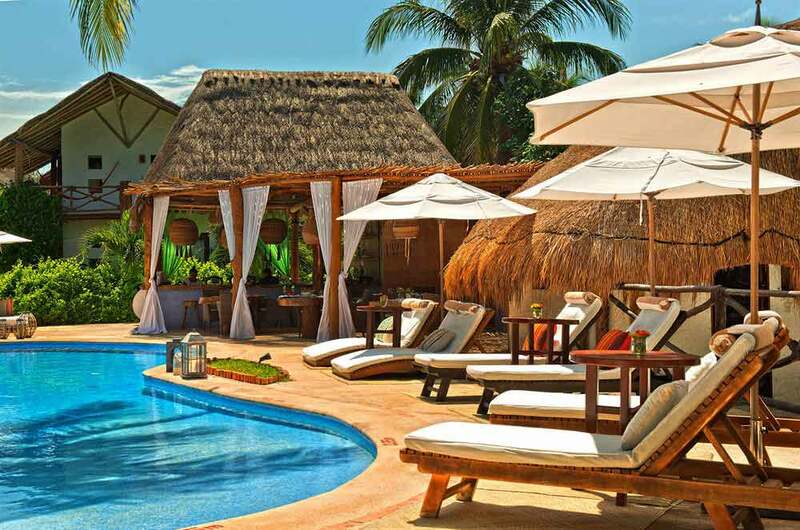 The hotel has a pool as well as a games area and a tiny gym under a thatched palapa. Rooms are relatively small but cabañas, which are a bit more expensive, are more spacious. Interesting design details like the shell showerheads and brightly colored walls give the hotel a boutique feel. There is also a restaurant onsite as well as a pool. Zomay boasts a collection of beautiful bungalows in a beachfront property. The bungalows vary in size and amenities but even the cheapest option is beautiful and unique. Many of the bungalows have kitchenettes, which allow you to cook or make fresh smoothies with the exotic island fruit. All rooms have mosquito netting which you will likely appreciate. 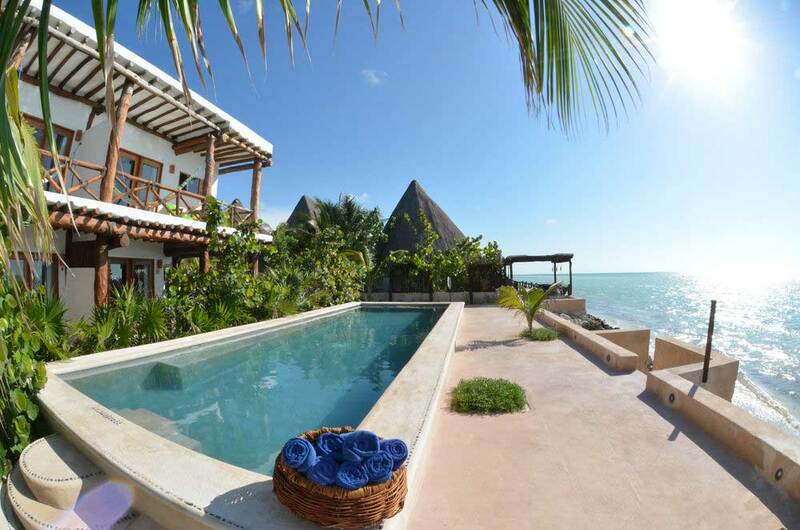 Twenty beach-front bungalows provide guests to Holbox a unique experience. There is a restaurant, outdoor pool, beautiful private beach with relaxing lounge chairs, and very friendly staff. Our favorite activity was paddleboarding out the front door, which they have for rent at the front desk. Luxurious, elegant, romantic and intimate are words that could all be used to describe CasaSandra. There is an ocean view from almost the entire property and suites are spacious, breezy and beautifully designed. The onsite restaurant has the New York Times seal of approval, with food, art and music playing a role in the sensuality of the hotel. This is a great option for truly getting away from it all and indulging the senses. 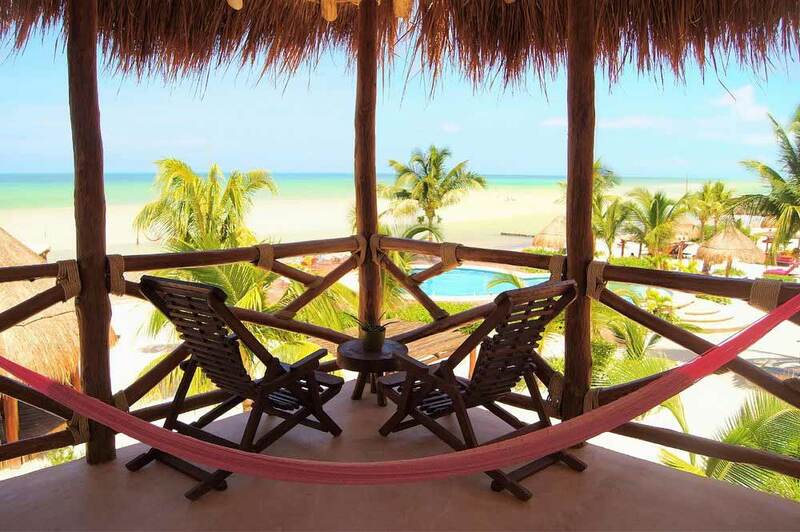 The hotel with the hammocks in the sea, Villas Flamingo is iconic among guests and islanders. Set right on the beachfront the property has a kind of shipwreck chic, offering stylish rooms and bungalows. The bungalows have private pools or jacuzzis, some of which look out onto the sea, making for an incredibly romantic setting. The pool and onsite restaurant mean that you could easily decide not to leave the hotel during your entire stay. Popular waterfront luxurious 27 room hotel on a private beach. Guests can enjoy the full-service spa, onsite restaurant, onsite bar, multiple pools, and outstanding service. We know travelers have many options when choosing where to reserve hotels. Travel Yucatan only serves the Riviera Maya and Yucatan Peninsula in Mexico providing traveler’s the ultimate resources to help plan vacations. 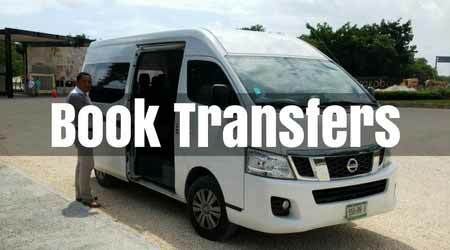 The only way we can fund the continued growth of the website is by having our loyal visitors choose our inventory to reserve hotels, tours, and VIP Holbox transfers.